The African Leadership Centre (ALC) was established in Kenya in June 2010 as a joint initiative of King’s College London and the University of Nairobi. The ALC is pleased to announce a call for applications for the Peace, Security and Development Fellowships for African Scholars starting in September 2018.
peace; security and conflict studies, and related departments. is not required. However candidates must demonstrate a basic familiarity with these issues. issues relating to peace and security in Africa. Successful candidates will be attached to a Research Cluster where they will work with ALC Research Associates and Senior Research Fellows to undertake research on select aspects of the ALC Research Agenda on “Future Peace and the Role of the State in Africa”. Fellowship upon returning to their countries and academic institutions. Candidates must be able to demonstrate the following values during the application phase: Independent thinking; Integrity; Pursuit of excellence; and respect for all forms of diversity. This is a fully funded opportunity, not including any visa application and processing costs.Funds will be made available to cover tuition, subsistence in the UK and Africa, accommodation, research-related costs, and all travel expenses related to the programme. However, successful applicants are expected to find their own accommodation both in the UK and Africa. In the UK successful candidates will be able to apply for University of London accommodation, and they can also make their own accommodation arrangements. Candidates are strongly advised to make all necessary accommodation arrangements well in advance of taking up their positions at King’s College London. Applications will be accepted Online at the following link: Peace, Security and Development Fellowships for African Scholars 2018–2019 Academic Year. The deadline for applications is 23:59 hrs, Sunday 8th April 2018. 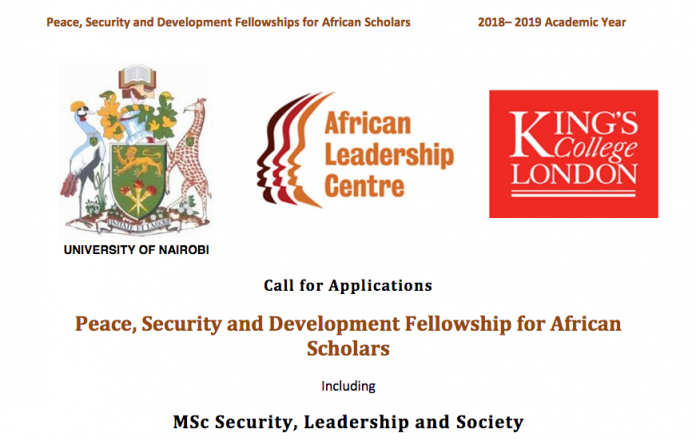 Applicants to the Fellowship Programme must make individual applications to the MSc Security, Leadership and Society by 23:59 hrs, Sunday 8th April 2018. What is the predominant vision of peace among Africa’s youth and future leaders? What are the greatest sources of insecurity for African youth? What leadership issues confront a next generation of youth seeking to build and sustain peace? What can we learn about African youth experiences for future discourses about the governance of security and development? How are the dynamics in African societies and societal responses to security and development challenges compelling a change in the state? How are African regional organisations responding to the rapidly changing African security landscape? (Note that you are required to submit your application to the MSc Security, Leadership and Society, as detailed above by the deadline of 23:59 hrs, Sunday 8th April 2018). applications will be accepted. If you are experiencing problems with the online application portal, please contact us at admissions@africanleadershipcentre.org.